A Concept2/UCanRow2 rowing master instructor is a true pied piper for the sport of indoor rowing. Our master instructors have years of experience teaching, most often with a strong on-water background as well. They are former rowing Olympians, national teamers and coaches, as well as being certified fitness professionals. They eat, breathe, and live the sport of indoor rowing and are excited about sharing it with others. Read on and you’ll find a bio for each one of them, as well as a favorite rowing workout. Are you ready to get certified by one of these awesome instructors? Click HERE to learn more about indoor rowing certification. Heather was born and raised in Kelowna, British Columbia and might still be living there if it wasn’t for a visit from the local rowing club to her PE class during her junior year of high school. The club brought along an erg and would be awarding the fastest boy and girl in the class a free set of rowing lessons. Heather won those lessons and within a year she was racing with the Canadian Junior Development team. Her next step was to the University of Michigan, where she was an All-American rower and Big Ten Athlete of the Year. She then went on to row for Team Canada for five years, racing at various World Cup and World Championship regattas. She placed 6th or higher at every international race and capped off her career in the Canadian women’s 8+ on the 2008 Olympic team. She later ran Seattle’s Erg Ed program, which partners with the Seattle Public Schools to bring indoor rowing to every middle school student within the city through the schools’ PE programs. The program has been adopted by USRowing’s America Rows program as a model for youth indoor rowing instruction. FAVORITE WORKOUT: 3 minutes on, 1 minute rest. She used to do 15 sets of this and start at 6k pace plus about 4 seconds and try to drop her 500m splits the entire workout. Now, due to a different fitness level and limited time, she does 8-10 sets, with the same approach to pacing. Chad began rowing in 1992, for U.C. Davis. After graduation, he coached a Varsity girls’ junior crew and the U.C. Davis men’s freshman crew for a couple of years. After taking a short break to put his B.S. 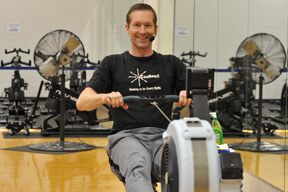 in geology to the test, Chad returned to rowing in 2002. He trained in single sculls with the Potomac Boat Club in hopes of making the 2004 Olympic Trials. Chad just missed making the trials in the single, but then partnered with another rower and together they made it to the trials in the double sculls. Chad has coached for the University of Maryland, PBC Masters men, and Bethesda Chevy-Chase junior crews. He is a certified personal trainer through the American Council on Exercise. Favorite rowing jams: ”The Stroke” by Billy Squier, “Yank Me, Crank Me” by Ted Nugent and “Push It” by Salt N Pepa. Angela has been a competitive rower since 1981 and has coached scholastic, collegiate, masters and Junior National teams. During the 1996 Olympic Games, Angela was a sports information specialist for the rowing venue. Angela has many specialties, including a Coaching education, Pilates Method Alliance and rowing for elderly populations. Some of her areas of interest include yoga and CrossFit. She holds many certifications such as, ACE personal trainer, AFAA group fitness instructor, CrossFit Level I and Level II, and is a Concept2 Master Instructor. 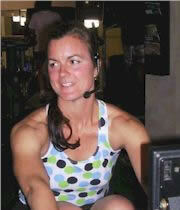 She has been an indoor rowing instructor since 1997 and was one of the original master instructors for CrossFit Rowing. She is also the creator of Rowga, a rowing/yoga hybrid class format, and teaches at the Workhouse Arts Center, in Lorton, VA.
Cassi started rowing at Georgia Tech in 1997 after seeing a crew rowing under the fog early one morning. She continued to row for 4.5 years, after which she became the GT Freshmen/Novice Women’s Head Coach for 5 more years. She has been a co-director for the Atlanta Erg Sprints for 12 years, and rowed competitively with the Atlanta Rowing Club. It is her personal mission to teach others how to row well, and more importantly, efficiently. In her desire to bring good rowing to all, Cassi has given rowing seminars at gyms all over Atlanta and helped found the indoor rowing program at FitWit in Atlanta. 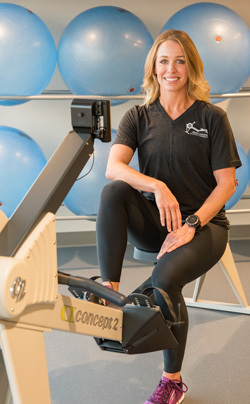 Now in Richmond, Virginia – she leads the indoor rowing program at Richmond Balance. Her focus is on good technique, efficient strokes and building strength. In addition to classes, she provides online rowing programming for people of all levels of experience, from the person who just bought an erg, to a seasoned rower, or the lifter looking for supplementary conditioning. Besides rowing, Cassi is both a licensed architect and a competitive powerlifter, most recently qualifying and competing at USAPL Raw Nationals. 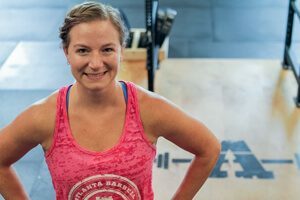 Cassi also works as a certified Starting Strength Coach at Richmond Balance, focusing on the process of building strength through programmatic barbell movements. She finds that the combination of lifting and rowing creates not only a stronger person, mentally and physically, but a more useful human being in general. Check out her podcast More Female Strength. “Cassi has the rare ability to channel her passion for the sport of rowing to her students. Katie comes from a rowing family. She was responding to “weigh enough,” (on-water rower speak for “stop”) and other directional cues long before she could sit in a racing shell. Having rowers in her family meant that rowing was woven into the fabric of her everyday life. So it was no surprise when Katie started rowing in high school (Newport Aquatic Center), and then continued into college (Loyola). Rowing turned into a passion for Katie due to its unique combination of technical skill, power, and connection with the other athletes and the water. For Katie there is nothing more amazing, gratifying, and truly awesome than the meticulous unison of a race-pace swing, the oars and athletes moving in perfect synchronicity, and feeling the strong connection through the water as the shell moves underneath. Rowing both on the water and indoors is beautiful, it is meditative, it is physically and mentally challenging, and it is something that she is excited to now be sharing with others! After years working in marketing and advertising, and then being at home with her children, Katie is excited to make a career shift into health and wellness. She’s working on a cancer-specific certification through the American College of Sports Medicine, and plans to use her broad knowledge to help clients through what may be some of their toughest life moments. In addition to her studies, she has found herself racing at a high level once again, competing in masters rowing for Minneapolis Rowing Club. Forever the competitive athlete, she has her eyes set on Masters Nationals 2018. FAVORITE WORKOUT: Katie’s favorite group erg workout is a testament to her southern California roots (Those lucky ones who get to row outside year-round! ): take the erg and your group outside, bring some up-tempo jams, and compete in a team relay. Pick your distance (usually a 10K), and see who gets there first! Nell was first introduced to rowing in the summer of 1997, right before starting college at UCLA. She saw an ad in a local magazine and decided to try it out. She immediately liked the athleticism of the sport. Once at UCLA Nell tried out for the crew and found she adored rowing more than anything she had done before. After college, she rowed with a group of women who placed 5th in the lightweight four division at the Head of the Charles Regatta in their first year of racing there. After many years in sweep boats, she turned to sculling. Since then, she has rowed 10 times at the Head of the Charles, medaling in the club single in 2010. In 2011 and 2012, she qualified for a free trip to Boston to compete in the prestigious C.R.A.S.H.-B. Sprints World Indoor Rowing Championship in the lightweight masters division. Nell is also a wealth of knowledge about running a fitness business, having founded and run RowFit Chicago-Chi-Town CrossFit. Some songs on her PLAYLIST are: “Lose Yourself” by Eminem, and “Girl Talk” by TLC. FAVORITE WORKOUT: 20 rounds of 45 seconds on, 15-second paddle, trying to hit the same average split each time. Will has been involved with rowing for almost 30 years. During the fall of 1986, he joined the Oakland (CA) Strokes Juniors team and later became a three-boat athlete for the Varsity squad, earning the state championship in 1989. After high school, Will was recruited to U.C. Berkeley, where his freshman 8+ went undefeated to the national championships and finished the season second in the nation. 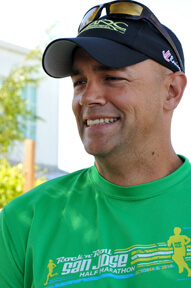 Will began coaching in 1996, as a graduate assistant at Berkeley. From 1998-2001, he was the strength coach and assistant of the boys Varsity team for the Marin Rowing Association. Currently, Will is the Juniors Head Coach at the North Bay Rowing Club and teaches indoor rowing classes at Active Sports Club in Petaluma, CA.